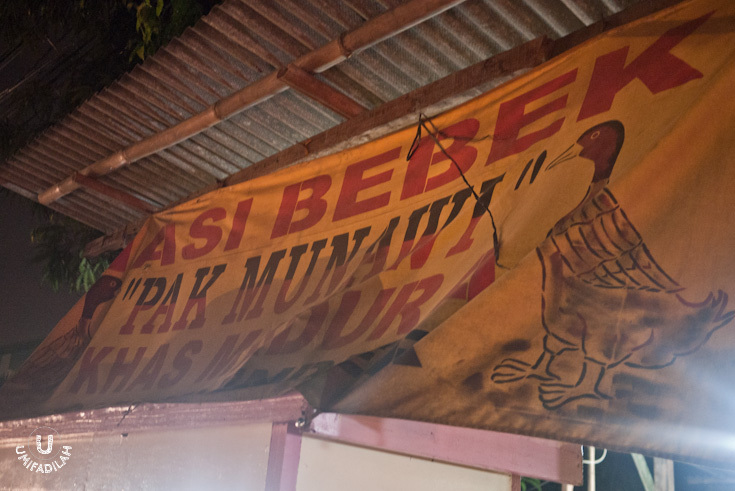 This article, along with this particular article made me go crazy about ‘Nasi Bebek Madura’. And I knew the ambitious side of me wouldn’t let anything stands between me & a plateful of those spicy duck feast. The last time I’ve drooled SO MUCH over some particular dishes I literally had myself waited for years before I flew to Kyoto, Japan, for the almighty way-too-awesome Omurice. Thank God this time no extra effort is needed because even though it’s popular in Madura, we also have them in Jakarta. 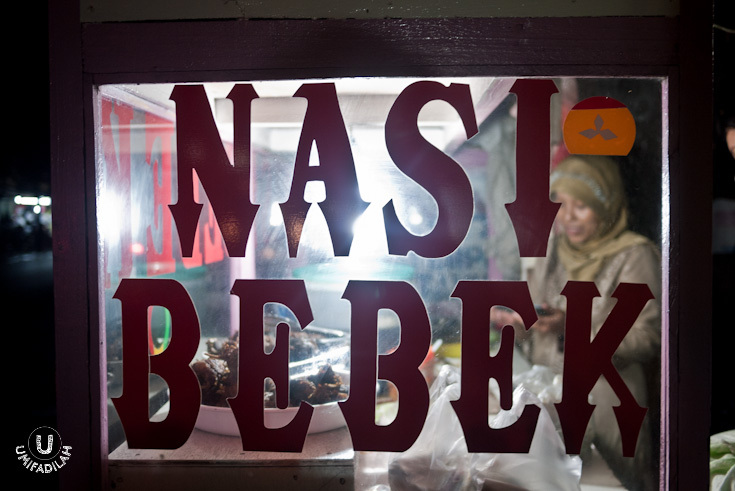 But first, what is Nasi Bebek and why is it so popular? 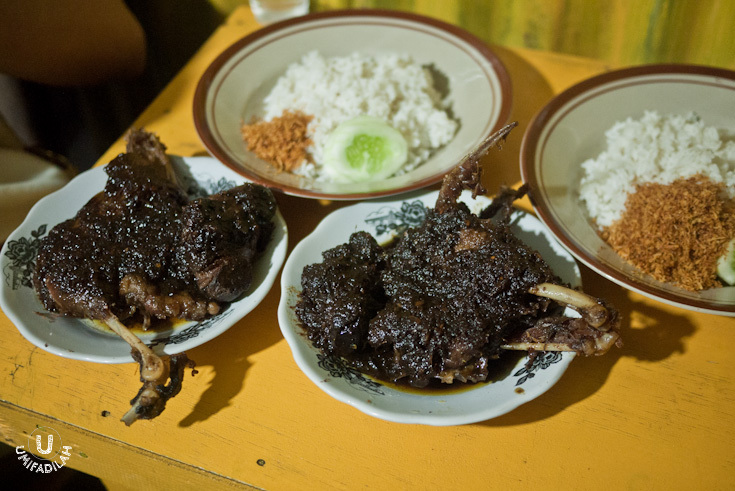 Nasi Bebek, literally means duck & rice dish, is so famous especially in Madura, an island near East Java where people really digs into HOT-burning spicy sensation in a dish. The most famous ‘Nasi Bebek Madura’ is probably Nasi Bebek Sinjay, in Bangkalan Madura (it’s on my bucketlist already, someday.. :p). I honestly have no idea on what makes Maduranese duck & rice dishes got so popular, hence when my friends asked me out I immediately said YES. 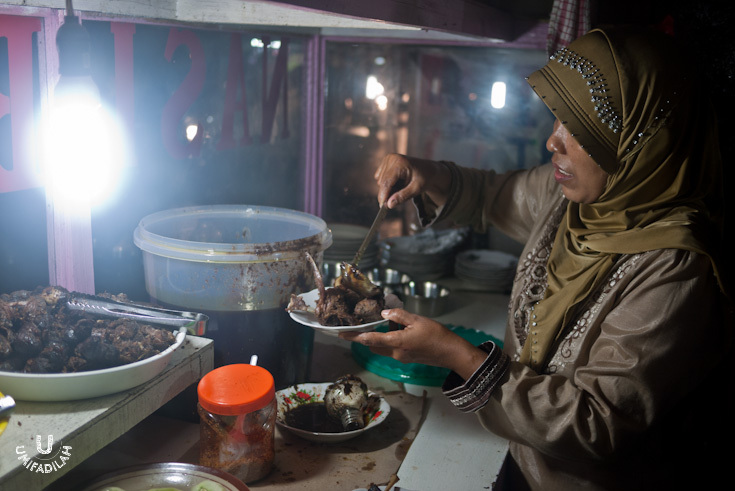 Located only few meters near Total Buah Segar in Ampera, it’s very easy to find this humble street food-carts. With huge yellow signage and bright neon lights, easily not to be missed. We were greeted by the owner’s wife, Siti Aisyah herself, who were kind enough to let us take photos & ask few things. Small cuts, both duck's breast & thigh - IDR 12k. Large cuts, double the size - IDR 24k. In here, they only serve few things: fried duck’s breast & thigh (both available in small cuts – priced at IDR 12k, and big cuts – IDR 24k), and also fried duck’s liver & gizzard. A plate of Nasi Bebek Madura consists of hot steamy white rice, fresh cucumber, and sprinkle of grated coconut (serundeng) on the side. All that, served with a piece of fried duck based upon your choice, topped with this ultimate dark, black relish that might not look appetizing to some, BUT I RECKON THAT’S WHERE THE ADDICTION BEGINS. So how do I say this. At first it might seem too oily and the black relish doesn't look appetizing at all, but damn it was really addictive. The spicy black relish is made from dozens of red bird-eye chilis pounded together with the leftover spices as a result of hours and hours of braising the duck. In Indonesia we call the traditional braising technique as “ungkep”. 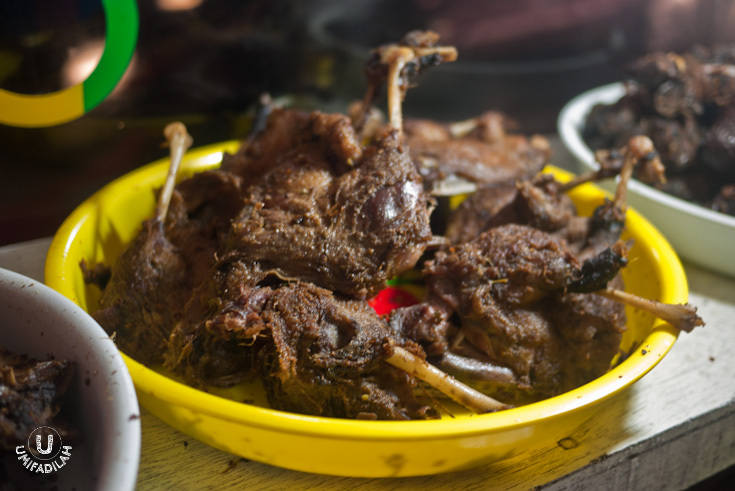 Dozens of duck cuts were slowly cooked for hours, along with herbs & spices such as garlic, shallot, ginger, lemongrass, galangal, coriander seeds, and LOTS of chilis – hence the fragrant spicy aroma. The duck itself is really tender, has a slightly dark red-brown-ish meat color inside and doesn’t contain lots of fat layer underneath its skin, they probably use young male duck in that case. You won’t struggle too much when tearing the duck’s meat, because it just fall right off the bone! Eat them together with hot steamy rice plus the black relish and the ‘serundeng’........OMFG DELICIOUS. The grated coconut adds a nice sweet sensation to tone down the spiciness of the relish and the savory duck. Wow. I’m out of words, really. I’m hooked. By how Maduranese people cooked their duck. It was my first experience and surely won’t be my last. I also read IOFLIFE’s coverage on Bebek Madura Mak Isa in Klender, East Jakarta, and hopefully someday I can do a taste comparison myself. People said that Bebek Madura Mak Isa’s way spicier but less oily, and also they don’t have the addition of grated coconut/serundeng as rice toppings. Can’t wait for another Bebek Madura journey! If you’re into spicy dishes, I strongly suggest you to try these.